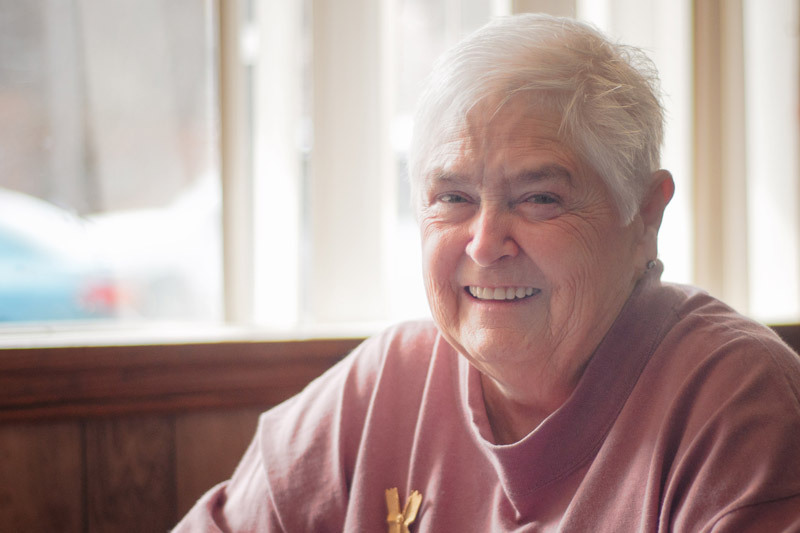 Meet Leonor, who has been volunteering for Visiting Nurse Association of Ohio for over 10 years. As a VNA volunteer, she’s been sewing gowns for VNA hospice patients in her home at a rate of 100 gowns per year. She provides all the supplies and materials herself. With the gowns, she also includes a protector or a bib for the patients. She adds flair and personality to each gown by adding decorative pins, lace or other fun additions like ties for the mens' gowns. 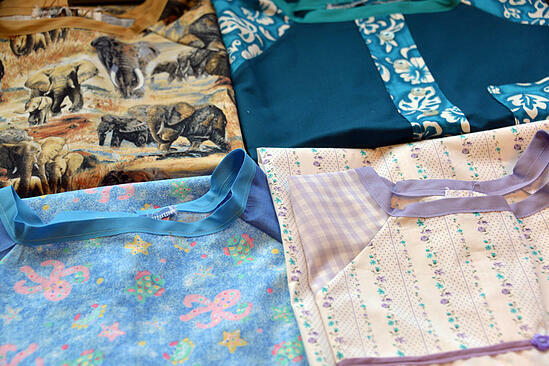 The latest batch of gowns that Leonor has sewn for patients. Photo by Thien Nguyen. They are designed with fabric that she buys herself and picks up anywhere she can get. “I go to a lot of garage sales,” she says. She never wastes anything. Even the scraps of fabric she donates to a group of women at the Lutheran church down the road who make quilts for people in need. With each gown, she also includes a little card with a special message or story. She works from her home on a beautiful white sewing machine that she refers to as her baby. She said they’ve only been apart three, maybe four times since she received “him” (the machine) as a graduation gift in 1967. She also keeps her mother’s rare 1930 Kenmore machine in her house. When she’s not sewing, Leonor volunteers regularly for the Great Lakes Science Center as part of their Cleveland Creates exhibit. She also volunteers at MedWish, which ships unused medical equipment to third-world countries in need of supplies. For Leonor, volunteering is just who she is. She won’t talk about what she gets out of volunteering or how it makes her feel. She simply pours herself into it – whether the task is sweeping up Legos at the Science Center, checking expiration dates on boxes of sutures at MedWish or sewing the next carefully crafted gown. She says she’s created 1,024 gowns and her goal is 2,000 gowns. Each gown is special as is each patient who receives the gown. She hopes that the uniqueness of the gown and the card that she writes a note on bring a little smile to someone who is certainly going through a very difficult time in their life. Send any flannel or cotton fabric donations to VNA of Ohio’s Hospice Department, 2500 East 22nd Street Cleveland 44115. Or, you can call us at 1-877-698-6264 for more information about volunteering at VNA of Ohio. Top: photo of Leonor by Thien Nguyen.